Quantic Dream has sued journalists for negative coverage, but judging from the reviews for the studio's Detroit: Become Human, the media isn't holding it against the studio. Detroit: Become Human director David Cage claims he doesn't want to be seen as "delivering a message" with his new title. And yet the progression of events surrounding the game over the last year is doing exactly that regardless of whether or not Cage likes what it says. Alongside the aforementioned interview response and the decision to present child abuse in the promo trailer, the reports around working conditions during the game's development sparked plenty of discussion. Earlier this year, three French newspapers reported on a toxic atmosphere at Quantic Dream, which apparently included homophoic and racist remarks, harassment, sexism, and a "schoolboy" atmosphere of tasteless jokes. Quantic Dream denied the allegations, calling them a "veritable smear campaign," then went on to the sue the outlets that reported on the story. It's one heck of a bad look, but when it came to addressing the end result, critics were clearly not influenced by any of the reporting. 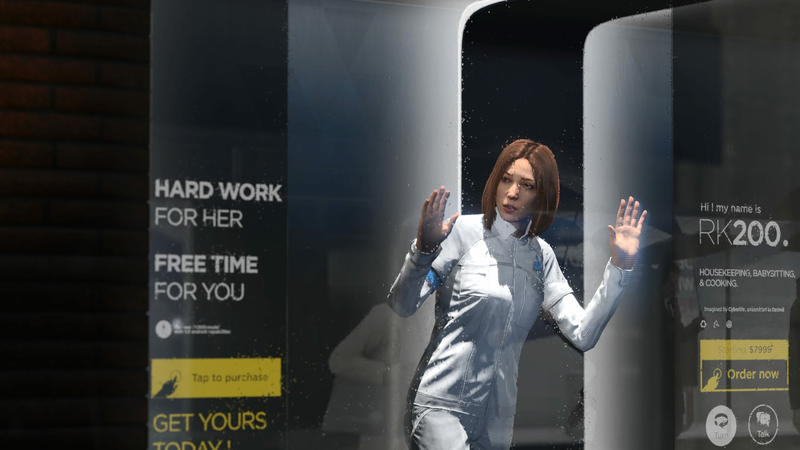 Detroit: Become Human impressed almost universally with its technical beauty and embrace of something audiences have craved for years: a feeling that their choices matter. "Initially gauche, this control language is so persistently applied that it does end up drawing you deeper into the game"
"Detroit unfolds in tightly-controlled scenes which combine dialogue - fulsome in options, cheesy and leaden in tone - with a modest amount of exploration and a weirdly compelling fascination with the most mundane of interactions," he says. "It's always asking you to twist a stick to open a door, tilt the controller to pour a drink, swipe the touchpad to read a magazine. Initially gauche, this control language is so persistently applied that it does end up drawing you deeper into the game - and the shift into 'quick-time event' action scenes feels more natural than it does in other games." "The trio of performances is excellent. Bryan Dechant is delightful as Connor thanks to his deadpan innocence, which makes for a great foil against the whirling dervish of his cynical partner, Clancy Brown's Lieutenant Hank Anderson. Valorie Curry brings quiet strength to Kara, and excels at selling her love for her ward, Alice, who is quite possibly the least charismatic video game child to have ever existed. Jesse Williams employs all of his dreamy Grey's Anatomy warmth as Markus and is never unlikeable, no matter how you choose to play him." 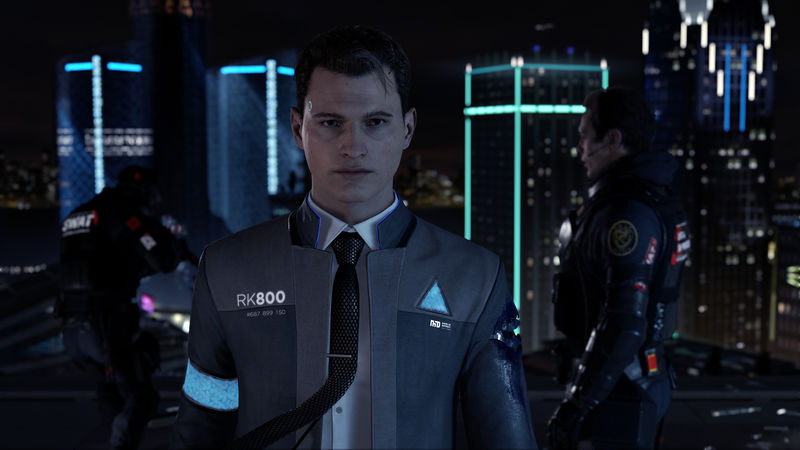 Detroit: Become Human follows the stories of three very different androids in the year 2038: Connor, Kara, and Markus. Most were impressed by the level of agency the player is offered. Detroit: Become Human is a game that finally seems to embrace player choice in a meaningful and complex way, presenting a flowchart after each story chapter that allows players to see what other possibilities they missed. "Detroit acknowledges what you've done, like how you've built your relationships, and the split-second decisions you've made"
While critics were universally impressed by this aspect, how those choices played on in practice was more divisive. Oliver Holmes in his 4-star review for The Guardian felt trapped by limited options and a lack of control in key moments. As he described it, "Players are promised the ability to co-write these stories, but too often you feel trapped on train-tracks, able to pull levers to go down different routes, but unable to jump off altogether." Conversely, Kimberley Wallace in her 8/10 review at Game Informer found the branching narratives to be one of the game's main highlights. "Choice-driven games typically struggle with giving players enough satisfying variations, but Detroit acknowledges what you've done, like how you've built your relationships, and the split-second decisions you've made, like taking a risk during a chase scene." Though she criticizes a lack of nuance in decision-making, the sheer number of possible paths that made sense (for the most part) impressed in its own right. Wallace isn't the only one that found Detroit's black and white take on issues to be a problem. David Cage doesn't exactly have a reputation for subtlty in game narratives, though some critics, such as Mike Williams at USGamer, found that the story worked on a micro level. "When Detroit moves a beyond the idea of 'these are mostly people, but people abuse them because they're not,' it gets better." "Detroit: Become Human tends to work well when it plays up the inherent inhumanity of its characters," he said. "One character finds themselves in a horrific graveyard of dismantled androids; broken, beaten creatures that look human, but are somehow surviving worse fates. Another character tries to comfort a friend when they meet their unactivated showfloor model. There's the eerie stillness of a forgotten theme park full of androids standing still with frozen smiles, waiting for just one family to visit. When Detroit moves a beyond the idea of 'these are mostly people, but people abuse them because they're not,' it gets better." That "it gets better" is in response to what almost every critic agreed was Detroit: Become Human's weakest link (or, in some views, its only weak link). As could be assumed from its trailers, the game tries far, far too hard to tell its audience it's dealing with difficult issues. Detroit attempts to tackle domestic abuse, slavery, civil rights, artificial intelligence, police brutality, and more, often in grandiose ways. Back at Eurogamer, Welsh was unimpressed with this aspect, saying, "I can't shake the feeling that Cage is trying to have his cake and eat it. That he is seeking to borrow the seriousness, the intensity, the emotional and moral weight of a very real and very painful struggle without engaging with all of its very real issues and without having to pick a side in the present, fraught cultural moment. Playing Detroit, everyone can identify with the handsome, multi-ethnic oppressed, and nobody has to look the oppressors in the eye and see themselves." "There's a deep lack of thought at the heart of Detroit that makes every attempt to draw from history and the real world feel misguided at best, distasteful at worst." Ultimately, most overall impressions of Detroit depended almost entirely on how much those in-your-face issues bothered the critic. No one argues that making the choice whether to repurpose the "I have a dream" speech or to awkwardly quote Descartes is a great one, but it comes down to whether or not you find a preponderance of similar moments to be insulting or merely eyeroll-worthy. Most critics were happy to label this a glaring flaw, but one they could live with in light of the game's technical mastery and impressive scope. "We already know the answer to the issues it raises," she says. "Is it cruel to torture sentient beings? Is discrimination bad? It uses androids to highlight ways in which we already treat humans terribly but it doesn't use them to offer any insight of any kind. It references racial discrimination throughout, like with its 'androids at the back of the bus' signs and it's frankly an insult to those who endure it in the real world to have it evoked so lazily. None of which is helped by the world building being inconsistent. No Androids signs litter the city but androids already have in-built limits on where they're allowed to go, so why do these signs even exist? There's a deep lack of thought at the heart of Detroit that makes every attempt to draw from history and the real world feel misguided at best, distasteful at worst."